Just when you're wondering which frontier the bicycle industry will push open next, SWISS bicycle maker BMC produced the world's first carbon nanotube (CNT) bike, a material that is now considered the strongest and stiffest material on the planet (..and I thought it was Boron Tri-Nitride) in terms of tensile strength and Young's modulus (elasticity). To improve toughness, the tubing is made in a proprietary process by adding a mixture of fine carbon nanotubes to the carbon-resin matrix. All the specific manufacturing related stuff is anyone's guess. If this bike were to be tested for strength to weight ratio, the figure would destroy the scales. Throughout, we avoid using the traditional carbon optic. Using only carefully aligned unidirectional fibers makes for even more accurately defined rigidity distribution. The Carbon Nano Tube Composite developed by Easton achieves unprecedented material values by the admixture of microscopically small carbon tubes. Integrated Skeleton Concept permits good force distribution near the nodal points by using carefully selected reinforcing elements. Each tube transition can be perfectly adapted to the flow of forces. You can recognize them from the dropouts. Pro Machine frame with seamlessly integrated carbon dropouts. The only metal component on the whole frame is the thread on the bottom bracket. 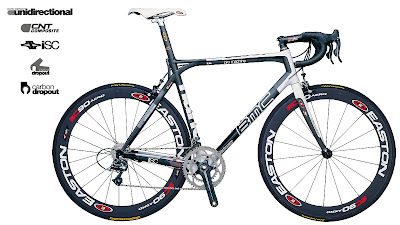 The material was developed for frame tubing by the bicycle division of Easton Sports. Carbon Nanotubes are a highly specialized area of material science research and people in the industry are just beginning to discover the properties and applications of the material. The discovery of nanotubes remains a contentious issue, especially because several scientists involved in the research could be likely candidates for the Nobel Prize [Wikipedia]. When I look at this technology, I'm NOT thinking in terms of simple tensile strength or stiffness values. Those may be way high compared to traditional materials. There is more to be considered, as in application specific questions - How will a bicycle tube made of this stuff compare to a conventional carbon fiber tube in terms of high and low cycle fatigue strength? What is the strength of the joints? Etc... etc.. If there are only marginal improvements in these properties, I'll be looking to save my pockets. Sigh...until some sensible dynamic test results come out, we're going to be stuck with ridiculously priced bicycles or complete show material. 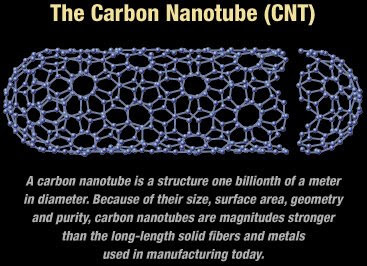 Please note that while carbon nanotubes have ultra properties, bikes (or anything for that matter) are NOT made entirely from nanotubes. 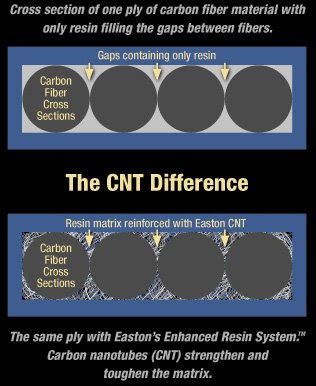 As Easton stated: carbon nanotubes reinforce the epoxy matrix. The epoxy matrix only makes up about 30% of the bikes weight, so a large increase in strength/modulus in the epoxy matrix will not increase the bikes strength/modulus by the same amount. In addition to there only being about 30% epoxy matrix, the carbon nanotubes occupy only 3-7% of the resin (not a lot of nanotubes). Carbon nanotubes show enormous potential for structural properties, but it will be a number of years before these ultra properties trickle down from laboratories to your bike rack. 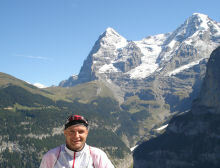 Great article, keep up the pollination! Hopefully, prices will come down and in a decade, carbon fatigue crashes will be a thing of the past. should have saved this one for april fools cause its a joke on the consumer. the change in finished properties from the nanotubes is extremely small. 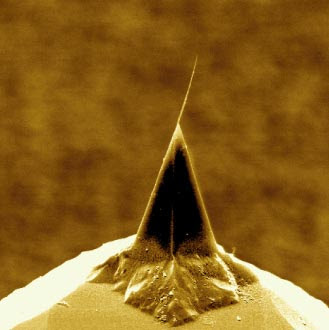 nanotubes have extremely high strength that is a product of their geometry but have currently not been developed to be useful for anything other than sounding cool. the easton carbon is high quality but the nanotubes do nothing other than allow them to charge more. the aerospace industry uses thermoplastic toughened epoxy to provide better damage tolerance but doesnt waste their time with nanotubes cause they care about performance not sounding cool. Lots of talk about the carbon nanotubes in the composite arena (which I work in). However, due to the cost, they are not an option most of the time. If I understand the technology right, it basically is used for resin replacement. You reduce weight by replacing resin with nanotubes. While strength to weight goes way up, most would suggest the bang for the buck is not there. It will be interesting to see how these and other nano technologies play out over the next few years. Good info... and the follow up comments. Thanks for educating me. Thank you all. You're basically on the same frequency as me when thinking about CNT. There is a trend in the cycling industry to come up with very minor improvements for vast cost--we all remember the ti screw packages. I have a feeling the CNT technology is the same at the moment. I feel the same about ceramic bearings which appear to deliver a microscopic improvement for a highly-visible $$$. Interesting info. 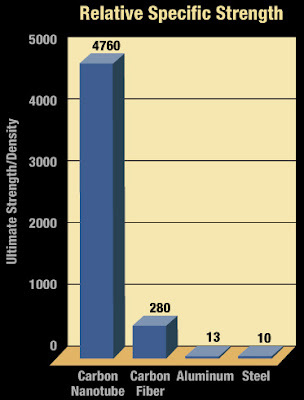 A glaring omission on the strength to weight ratio graphic was titanium as a test material. I agree with the comment above. Where is titanium in the graph?